Now you can add links to your todo list. Links will be highlighted and will lead to the link in new window. There is a new Setting on the settings panel to change the Text size if you prefer bigger font size for project names and tasks. Yes! You can Print your list by selecting the list and clicking on the Print Icon in the top right corner of the screen. This will print the current list exactly as it is seen on the screen. In case you have collapsed task groups it will print exactly like that. 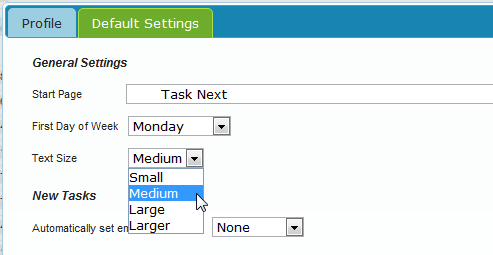 You can also change the font size on the settings panel as described above and that will print using that size. The small dragging handler for tasks and projects has been slightly changed. Now the dragging area is twice as big as before and that makes dragging tasks around much easier. When you edit an item and you click away, now the changed task is saved automatically. In the previous version it was reverting the change if you didn’t press enter. You can still use Enter and Esc to save or discharge the change. The color of the big task input box has been changed to grey. It looks less distracting than the red we had before.